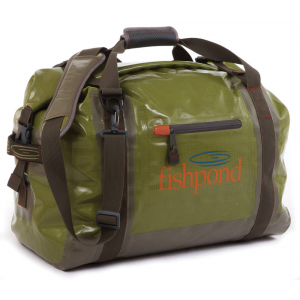 Fishpond Westwater Roll Top Duffel – Free US Shipping AvailableA bomber water resistant travel duffel *TPU welded fabric construction *Roll top design to keep your gear safe *One exterior accessory pocket *Wide mouth for great access and organization *Two padded jacquard nylon webbing handles *Rubber shoulder strap included *New and improved recycled Fishpond fabric *1.9lb – *55L (Pocket: .2L) – *3,355 cu. in. – *22″ x 14″ x 11″Scroll down for pricing & availability.